A UNC researcher investigates why North Carolina teachers are having trouble breathing—in their own classrooms. My sophomore year of high school, I noticed something strange about my classroom. The air felt thick, with a heavy, dusty smell. At the same time, my teacher began to develop a persistent cough. My teacher says when she was away from the room during summer and winter school breaks, her health would go back to normal. The reason soon became clear. There was nothing wrong with my teacher; her classroom was the culprit for her unsettling breathing problems. She says the Occupational Safety and Health Administration (OSHA) later found large amounts of dust in the air ducts and particles in the air that contributed to the classroom’s bad air quality. Poor classroom air quality like this is not an isolated problem. Kim Gaetz, who earned her PhD in epidemiology at UNC last year, discovered that it’s not difficult to find classrooms with bad air quality in North Carolina. 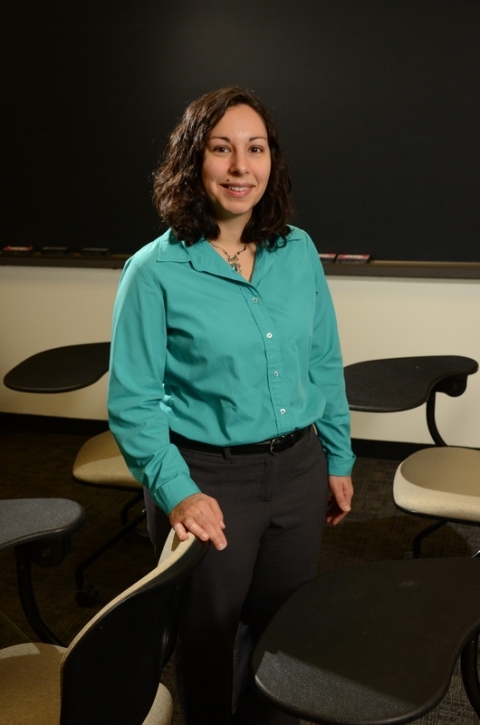 She conducted her research with 10 schools in two North Carolina districts. She used hygrometers to find classrooms’ relative humidity, a measure of how much moisture is in the air. Out of the many factors that can contribute to poor air quality, Gaetz chose to measure humidity because of the strong impact it can have on health. Humidity that is too low can lead to dry eyes and skin. High humidity can encourage dust mite reproduction, mold growth, and can attract rodents and cockroaches, which cause allergies. To find the perfect range, Gaetz used the Environmental Protection Agency’s recommendation that classrooms keep their humidity between 30 and 60 percent. Keeping humidity within this range can reduce the amount of harmful chemicals, like formaldehyde, in the air. There is even evidence, Gaetz says, that keeping humidity within the ideal range can prevent the spread of infectious diseases, like influenza. Between October 2010 and June 2011, Gaetz asked the participating teachers—over 100 of them—for permission to put hygrometers in their breathing zone, or an area of their classroom where they spent most of their time. She also asked the teachers to fill out a survey detailing their health and work history, and she conducted an initial air quality inspection of the classrooms. Along with that, the participants filled out weekly surveys about their health. Gaetz found that schools had an especially hard time controlling humidity in the winter, when the heating systems created dry indoor air, and in warmer months, when air conditioning units created humid indoor air. Economizers, which are devices that reduce energy consumption and costs, also raised humidity in classrooms. However, she says, schools that maintained their systems four times per year, as opposed to once, were more likely to stay within the recommended range. Gaetz says there was an increase in wheezing, tightness of chest, and shortness of breath among any teachers who had especially high or low humidity for at least 5 days in a row. Gaetz calls the symptoms experienced by these teachers “pre-asthmatic,” because they could lead to asthma or be a sign of undiagnosed asthma. While her sample size was not large enough to say conclusively that humidity out of the ideal range was affecting the health of teachers, Gaetz said the suggestion that it does has made her want to look into doing a larger study. Gaetz also hopes to expand her research to other influences of bad air quality in classrooms, including carbon dioxide and common chemicals. Gaetz also hopes to pursue research on how humidity can affect the spread of diseases. She says if researching air quality can protect teachers and students, it is worth looking into. Gaetz says it is important to her to find ways to give back to the communities where she is conducting her research. She trained custodians on how to conduct air quality inspections and fix things like dirty or broken filters. She also hosted programs in which teachers were given tips on how to alleviate asthma symptoms and improve air quality from organizations like the American Lung Cancer Association. Gaetz recalls an incident where she noticed a teacher consistently reporting severe headaches and fatigue in her weekly surveys. Upon an inspection of the classroom, Gaetz discovered that the teacher had turned off her loud air conditioning system so her students could hear her. This caused carbon dioxide to build up in the classroom, possibly triggering her symptoms. Gaetz suggested the teacher turn on the fan in the air conditioning unit to remove the gas. The teacher did. The carbon dioxide buildup disappeared, and so did the headaches.